In Java 11, a new default method, toArray(IntFunction), has been added to the java.util.Collection interface, which allows the collection's elements to be transferred to a newly created array of a desired runtime type. The HTTP Client API also supports asynchonous requests via the sendAsync method which returns a CompletableFuture, as shown below. This means that the thread executing the request doesn't have to wait for the I/O to complete and can be used to run other tasks. In my previous post, I showed how to convert a java.sql.ResultSet to JSON and stream it back to the caller. This post, is about streaming it in CSV format instead. Streaming allows you to transfer the data, little by little, without having to load it all into the server's memory. The following class (also available in my GitHub Repository) can be used to convert the ResultSet to CSV. Note that this class implements Spring's ResultSetExtractor, which can be used by a JdbcTemplate to extract results from a ResultSet. This post shows how you can convert a java.sql.ResultSet to JSON and stream it back to the caller. This is useful if you want to send a large dataset from a JDBC DataSource to a web application in JSON format. Streaming allows you to transfer the data, little by little, without having to load it all into the server's memory. The following class (also available in my GitHub Repository) can be used to convert the ResultSet to JSON. Note that this class implements Spring's ResultSetExtractor, which can be used by a JdbcTemplate to extract results from a ResultSet. * Streams a ResultSet as JSON. This post shows how you can mock a java.sql.ResultSet using Mockito. It can be used to help unit test code which performs operations on ResultSets (such as a ResultSetExtractor) without relying on an external datasource. The code for MockResultSet is shown below (also available in my GitHub Repository). Note that I have only mocked a few methods such as next, getString and getObject but it is quite easy to mock the rest by following the same pattern. * Creates the mock ResultSet. var removes the need to have explicit types written in your code. Not only does this reduce repetition but it also makes your code easier to maintain because if, for example, you decide to change the types of the objects stored in your map in the future, you would only need to alter one line of code. As demonstrated above, v is of type Circle and if you try to reassign it to Square, the compiler will throw an error. HTML5 introduced a new date input type which allows a user to enter a date using a date picker. However, not all browsers support this input type. In unsupported browsers, such as Internet Explorer, you will simply see a text input field. In this post, I will show how you can detect if a browser supports the date input type and how you can fall back to using jQuery's date picker if it doesn't. The following code creates an input element and sets its type to date. If the browser does not support date input, this operation will not work and the input type will degrade to text. 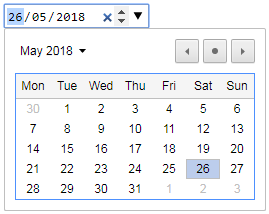 The JSFiddle below shows how you would use jQuery's date picker if the browser does not support date input. The following HTML snippet shows how you can disable the Submit button on a form to prevent multiple submissions. When the Submit button is clicked, the button is disabled and a progress bar is displayed. The progress tag introduced in HTML5 can be used to represent the progress of a task. This post shows how you can write JUnit tests to check if an object matches a JSON string. This is important if you are implementing REST services and want to test if your service produces the expected JSON response. The following snippet shows how you can compare an object (a List, in this case) against its JSON representation using JSONassert. In order to make it simpler to write such unit tests, I have written a Hamcrest Matcher called IsEqualJSON for comparing JSON objects. It still uses JSONassert but allows you to express your tests in a more fluent way. * A Matcher for comparing JSON. return o instanceof String ?